A great deal has been said recently of Brazil's declining unemployment rate - which is now less than 40% of what it was a decade ago. Impressive indeed. But is this an indication of stabilization in the nation's economic growth? Hardly. 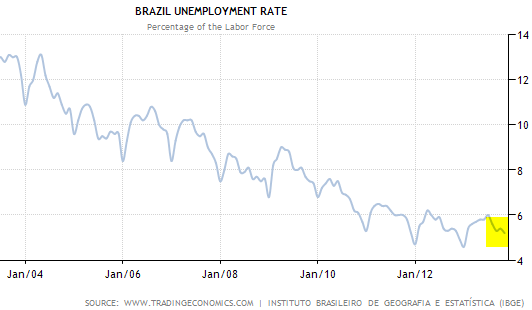 It turns out that Brazil is experiencing a decline in the overall labor force, causing improved unemployment statistics. Furthermore, the nation's real wage growth has been slowing. 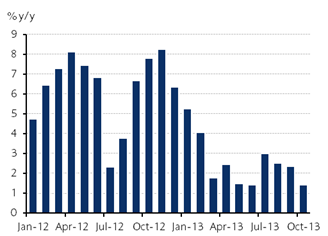 In spite of the seemingly strong unemployment numbers, Brazil's overall economic growth remains weak. The good old days of China-driven commodity boom are over. Financier Worldwide: - In recent years, Brazil has benefited significantly from enormous rises in commodity prices. However, analysts have suggested that these price increases were entirely artificial, driven by record low interest rates in the US and the huge demand for commodities from China. The commodity price boom is over and, with the prospect of the US Federal Reserve stimulus package soon being phased out, there is likely to be a great deal of concern across all emerging economies, including Brazil. Both the current account and the government balance are now firmly in the red. And forecasts show further deterioration. 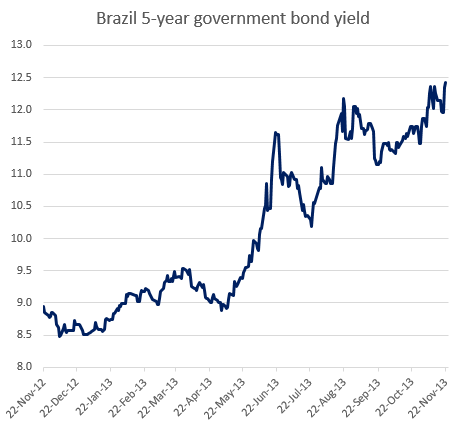 As a result, market participants are increasingly convinced that Brazil's government debt will soon be downgraded. Bloomberg investor survey results are shown below. 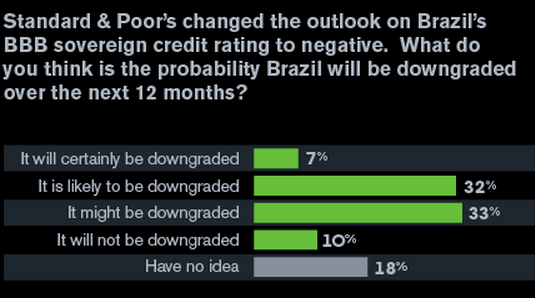 Bloomberg: - Investors have never been more pessimistic about Brazil President Dilma Rousseff’s policies, with only 10 percent saying the nation can avoid a credit-rating downgrade in the next year, a Bloomberg Global Poll shows. Fifty-one percent say they are pessimistic about Rousseff’s policies, compared with 22 percent when she took office in January 2011, according to the poll of 750 analysts, investors and traders who are Bloomberg subscribers. The world’s second-largest emerging market will offer one of the worst opportunities over the next year compared with the U.S., U.K., European Union, Japan, India, Russia and China, respondents say. Brazil's worsening budget deficit, political corruption (see story), excessive government spending, and prolonged inflation - combined with the Fed's upcoming taper - have resulted in deteriorating confidence in the nation's government debt. The 5-year bond yield is approaching 12.5% - a multi-year high. So when you hear the country's president Dilma Rousseff make statements such as “We are the only major country with full employment" and "Whoever bets against Brazil will always lose", don't pay attention. She is trying to keep her job as the national elections approach. 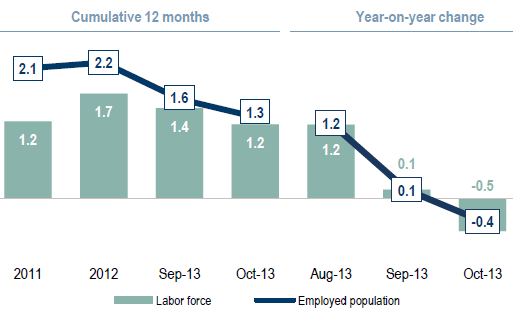 The reality is far worse than the employment numbers would suggest and 2014 is bound to be a rough year for Brazil.